Christy Cincotta – Executive Director Christy has been with the Tyonek Tribal Conservation District since October of 2011, and was hired by the TTCD board of directors as the first employee for TTCD. Christy has a BS in Biology from Providence College in her home state of Rhode Island and an MS in Biology from Rutgers University in New Jersey. An avid hiker and outdoors person, Christy has previously worked in Washington, Georgia, California, New Jersey, and Rhode Island doing community conservation work. Christy is thrilled to be part of an organization that allows her to work in beautiful places with amazing people, and is thankful for the opportunity to be welcomed into the community of Tyonek. Nicole Swenson – Conservation Director Nicole began working with TTCD in April of 2014. Nicole has a bachelor’s degree in Biology from the University of Montana and a Master’s of Science in Natural Resource Management from the University of Alaska, Fairbanks. 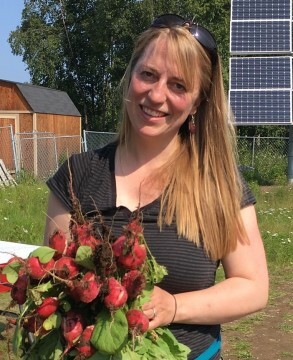 Having grown up in Alaska, she is passionate about Alaska’s natural resources and local food production. In her position, she has the opportunity to work with the residents of TTCD’s district to provide guidance on many exciting projects such as the Tyonek garden and a district wide invasive weeds monitoring program. She is honored to be a part of TTCD and is eager to help people grow their own food and sustainably use their resources. Tonya Kaloa – Program Assistant Tonya started working for TTCD in February, 2014, and is very excited for the opportunity to grow with this organization. 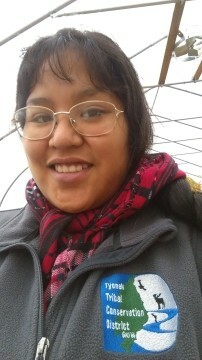 In her role as the Program Assistant, Tonya is looking forward to learning more about the issues and needs for the native people, as well as working with other native villages across Alaska. Tonya is eager to be a part of helping natives with their hopes and dreams for their lands, waters, traditions and for their future. One of Tonya’s major goals involves bringing education programs to the youth of Tyonek. Tonya is excited to be a part of teaching future generations how to preserve and use natural resources for their homeland. Jillian Jablonski – Conservation Technician Jillian began working for TTCD in March 2018 as the Conservation Technician. She has a B.S. in Environmental Science from Oregon State University and is finishing her M.S. in Conservation Ecology at the University of Alaska Anchorage. 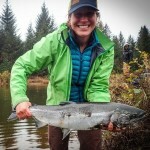 She has previously worked in the wildlife, plants, and fisheries fields across southcentral Alaska. Jillian is excited for the opportunity to work with the community of Tyonek, and to work to conserve and sustain the natural resources of the area.